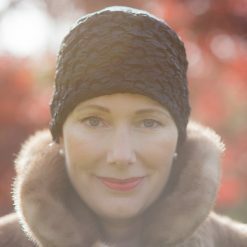 This special occasion chemotherapy hat is a simple style but made in beautiful luxurious fabrics. It is the hat to wear to a party or any occasion where you want to look sophisticated but be comfortable at the same time. The band is made in either sparkling sequin in charcoal or navy, a textured circle black silk or a grey pleated silk organza. These beautiful fabrics add interest and sparkle around the face which will make you look ready for a party. The circular crown & lining is softest bamboo. If you would prefer the crown covered in sequins too then just tell me at time of ordering and I will make specifically to your requirements. It sits low at the nape of neck and the stretchy jersey means it will stretch to fit your head snugly. The circular crown section ensures a neat fit. It is not too thick & heavy so can be worn comfortable indoors. I have called this hat Evie. I offer this chemotherapy special occasion hat in 4 different fabrics, a charcoal grey oblong shaped sequin on stretch tulle on black bamboo fabric for a super shiny gorgeous reflection around the face. A navy circular sequin on stretch tulle with the softest navy bamboo fabric for those who prefer navy to black. A black stretch 100% silk fabric which has a circular scrunched effect to create a circular indent in the fabric (made by wrapping & setting silk around coins!) which is lined in the soft black bamboo fabric which gives a luxurious texture to the fabric & creates volume around the face – this one will take you from lunch to dinner. Finally, a grey 100% silk fabric which has been pleated into a chevron design, giving lots of texture and interest; it is lined with the softest marl grey bamboo jersey fabric and the crown is of the same grey marl fabric. 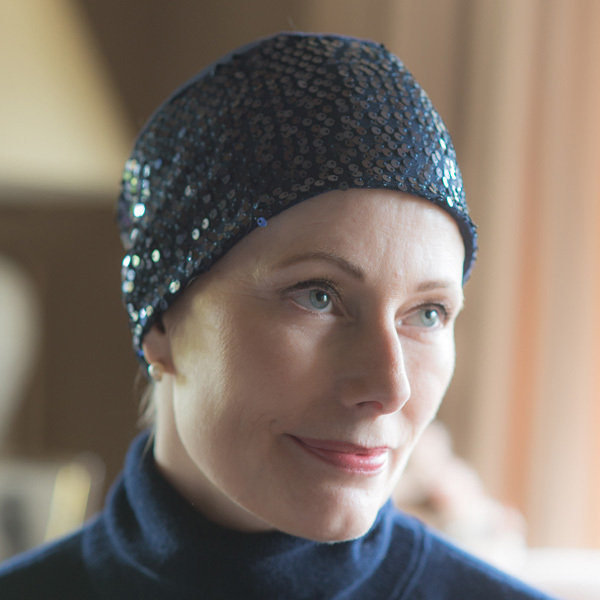 All of the 4 dazzling fabrics are lined with the amazingly soft bamboo jersey, it really is the most comfortable of fabrics for a chemo hat. The properties of bamboo are never ending – it is antibacterial, anti-static, offers UV protection & perfect for sensitive skin – as your scalp so often becomes sore, dry & itchy during chemotherapy treatment for cancer this really is the perfect choice. As it is a hollow fibre like wool it will keep you warm in the winter & is also breathable & wickable & said to keep you 4% cooler than cotton in the summer.